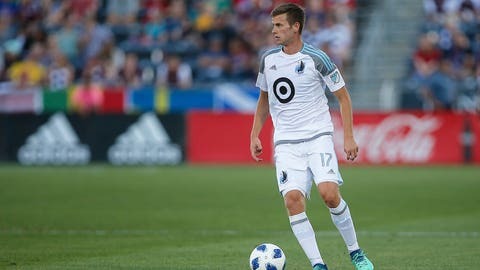 Minnesota United FC midfielder Collin Martin came out publically as gay Friday morning just hours before the team celebrates “Pride Night,” becoming the only active male athlete in the major professional sports leagues to come out. The 23-year-old made the announcement Friday on Twitter, revealing that his teammates, family and friends have known for some time. “I have been out as a gay man for many years to my family and friends, and this includes my teammates,” Martin wrote. Martin is the second openly gay MLS player following LA Galaxy’s Robbie Rogers, who retired last year. Cyd Zeigler, co-founder of the LGBT sports publication Outsports.com, confirmed Martin is the only current out male athlete in the major leagues. “I have received only kindness and acceptance from everyone in Major League Soccer and that has made the decision to come out publicly that much easier,” Martin said. Martin is in his sixth MLS season. He was traded to Minnesota in 2017 after signing with DC United in 2013. Minnesota will sport rainbow numbers on their jerseys for their game against FC Dallas on Friday in celebration of Pride Night.